Jewelweed's dangling orange blossoms develop into green seedpods, such as the ones above and just to the right of this blossom. Ripe seedpods explode at a touch, sending seeds flying and providing great fun for kids. Jewelweed seedpods are ripening, so there's fun to be had in Westborough's woods, especially for kids. A patch of orange jewelweed (Impatiens capensis) offers considerable entertainment. The plants grow about four feet tall and bear many dangling, pouch-like orange blossoms. These "jewels" develop into slender seedpods that explode at a touch, flinging seeds 4 or 5 feet away, much to the delight of youngsters who are happy to help nature along. Not surprisingly, other names for the plant include touch-me-not and snapweed. It begins flowering in mid-July and continues into mid-September, but late August is just about the best time for blossoms and plenty of ripening seedpods. Look for jewelweed in partly shady, moist places with rich soil. 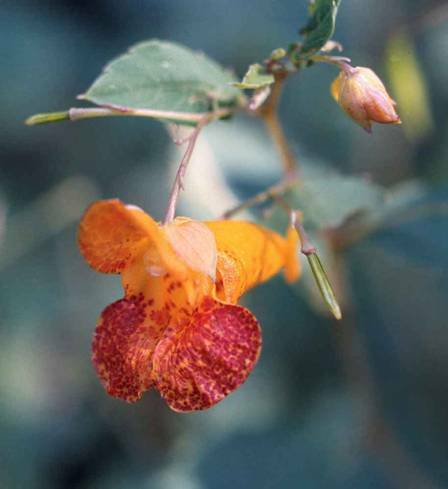 Jewelweed is related to the impatiens plants that are so popular for shady summer gardens, and both plants thrive in similar conditions. You'll find jewelweed along stream banks and roadside drainage ditches and in other damp areas. Jewelweed is also good for attracting hummingbirds. They go to its bright orange blossoms, and their long beaks are well suited for reaching far back into the spur of the flower. Butterflies and bumblebees also seek out the dangling blossoms. For some people, another virtue of jewelweed is its reputed usefulness in preventing or treating the rash from poison ivy. If they accidentally touch poison ivy, they look for jewelweed, which often grows nearby, since the same conditions are good for both plants. They crush its leaves and succulent stems and rub the sap on their skin, where it may keep the poison ivy oil from sticking. Those who swear by jewelweed as a remedy for poison ivy sometimes make their own jewelweed potion to keep on hand. They pick the plants early in the season before they blossom. (It's OK to do this where jewelweed is abundant.) Then they boil the plants in water for about half an hour and store the resulting orange liquid in the refrigerator to use on poison ivy rash as needed. Some people even make ice cubes from the liquid so they can apply the ice cubes to a poison ivy rash at any time. Like so much herbal medicine, the use of jewelweed for treating poison ivy probably came to us from the Native Americans. Various tribes used jewelweed as an external treatment for poison ivy, skin ailments such as eczema and athlete's foot, and wounds. Some used it as a tea to treat measles. Colonists used the sap as a yellow dye for wool. In addition to its lovely orange flowers, jewelweed can also bear a second kind of flower. This other flower is small, barely noticeable, and budlike. It never opens and is self-pollinating, so it doesn't need pollinating insects or hummingbirds. This type of flower is a kind of insurance policy for the plant, enabling it to produce seeds even when it is stresssed or growing in unfavorable conditions. The orange jewelweed or spotted touch-me-not that we have in Westborough is a native annual wildflower, found throughout much of the U.S. Another jewelweed with yellow flowers, called pale touch-me-not (Impatiens pallida), grows in western parts of Massachusetts and Vermont. If favors mountain woods and limestone soils. In some places, yellow and orange jewelweed grow together in the wild, making a lovely sight. New England also has a third jewelweed, a larger and coarser plant with light purple flowers (Impatiens glandulifera). Sometimes called policeman's hat for the shape and color of the flowers, this jewelweed escaped from gardens and now grows in northern New England and some parts of Massachusetts.